In this episode David Begin & Henry Lopez discuss the benefits of learning how to delegate effectively to help you manage and grow your carwash business. Why are we hesitant to delegate? Perhaps because we think we can do it better than anyone else. We understand best what we want and the results we are looking for, and truth is, sometimes we are “best” at it. But to grow and have time to enjoy your life, you must learn to delegate effectively. David mentioned Strategic Coach and how that training has helped him become a better carwash business owner. In particular, applying the “80% Rule”. Avoid trying to be a perfectionist on the wrong things. It takes time, energy, effort and a process to delegate effectively. Why delegate? To facilitate the growth of your carwash, to leverage the great ideas and skills of others, to develop your team, and to be able to take time off from the business. You will often get great ideas and input from those to whom you delegate. Three types of tasks to consider delegating: things you don’t like to do, what you are not good at, and tasks that don’t move your business forward or are not strategic. 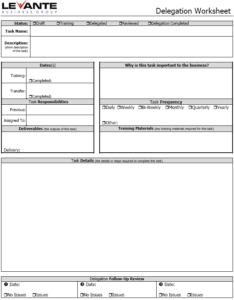 Delegation Worksheet (see link below): a tool that helps you delegate effectively. It helps improves communication, which is one of the keys to effective delegation. You can complete the worksheet or simply follow the steps when delegating. David has implemented this worksheet at his car washing locations. Be prepared for and expect that you will not always be successful on your first attempt at delegating a task. Once you delegate a task, be sure to let go of it and not take it back. If it’s not being executed correctly or efficiently, then re-train or delegate to someone else. Accountability is important. The person assuming the task must be responsible, and be held accountable, to owning the task. What tasks can you consider delegating today? This Delegation Worksheet is designed to help you effectively and efficiently delegate tasks within your business. Successful delegation requires clear communication. By communication (in writing) the details of the task being delegated, you significantly reduce misunderstandings and increase accountability. It may take a little longer initially to delegate a task using this technique, but it will result in greater success and less overall time spent having to explain it again or recovering from mistakes later. Delegation is a process. It begins with a clear definition of the task to be delegated. After describing it, in writing, you will need to properly train the person or team assuming this task. After training for the task is completed, then the task is officially delegated. The process is not complete, however, without first conducting follow-up reviews to make sure the task is being executed correctly and efficiently. The Levante Delegation Worksheet download includes instructions for each field on the form.